The DVO tools are the foundation for the Phoenix products. The tools were designed for Film and Video restoration but many of them have applications in the new digital camera domain. Phoenix Touch contains powerful automatic dust-busting capability alongside a high quality manual repair toolset that can turn around intensive repair tasks quickly. Phoenix Touch can also act as assist station to Phoenix Refine and Phoenix Finish. 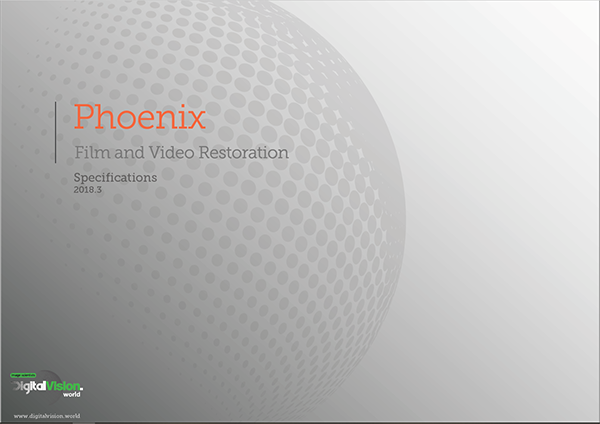 Phoenix Video is a highly automated restoration and enhancement solution for handling video content stored on tape formats such as 1¨, U-Matic and Betacam SP.. The system handles common image defects such as dropouts, severe noise, cross colour artifacts, line sync problems and more. Additional features include motion compensated frame rate conversion and high-quality upscaling, as well as full support for common broadcast codecs. Comprehensive toolset for repairing damaged film. Combining the best in automatic, semi-automatic and manual restoration tools, Phoenix Refine adds editorial and effects processing capability. The result is a single system with outputs for both mastering or archive.